LORENZO di CIACCIO: Hello, I’m Lorenzo di Ciaccio, the CEO and cofounder of Pedius, and that would allow deaf people to make phone calls, and this is your Assistive Technology Update. JOSH ANDERSON: Hello and welcome to your Assistive Technology Update, a weekly dose of information that keeps you up-to-date on the latest developments in the field of technology designed to assist individuals with disabilities and special needs. I’m your host, Josh Anderson, with the INDATA Project at Easter Seals Crossroads in beautiful Indianapolis, Indiana. 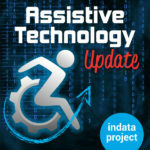 Welcome to episode 405 of Assistive Technology Update. It’s scheduled to be released on March 1, 2019. On today’s show, we are very excited to have Lorenzo di Ciaccio, the CEO and cofounder of Pedius to talk about the app and how it can help individuals who are deaf to make phone calls. We’ve also got a very feel-good story about an angel investor investing in autism app in Australia, as well as some new things coming out from McGraw-Hill in their learning platform. And a nice story about an individual talking about the machines they use and the importance of human interaction. Thank you so much for choosing to listen to us today, and let’s get on with the show. Do you ever find yourself sitting around having questions about assistive technology? How would I fix this? How would I do that? How can I get this possibly to work for this individual? Or, I bought this and it doesn’t work we do they make anything that does this? These are all great questions. If you like asking questions or like having a group of colorful characters actually try to answer them, try out our sister podcast, Assistive Technology Frequently Asked Questions, or ATFAQ. You can find this anywhere that you download your podcasts. If you want to make our host Brian Norton actually happy, you should send him a tweet with hashtag ATFAQ. He doesn’t get many of these, and he asks for them all the time. If you want to make our sister show and the great Brian Norton happy, check out ATFAQ and send him a tweet with hashtag ATFAQ. If you don’t have time to listen to a full podcast, be sure to check out Accessibility Minute, our one minute long podcast that will help you learn about new assistive technology. Check it out where you get your podcast. Let’s start off today with a feel-good story out of Australia. This is from CIO.com.au, and it’s titled, “Angel investor gives autism app a $3 million boost.” It’s by George Nott, and it talks about a digital learning platform for kids with autism. It’s $3 million in funding from an angel investor. The app is called Rockmelon. It was launched last year in Australia. It provides curated interactive learning modules for children diagnosed with autism spectrum disorder. So we’ve talked to some folks who have made these kinds of apps in the past, and this was made the same way as some of the folks we’ve talked to. A parent has a child with autism and sees a big need. A lot of kids don’t really get all the therapy they need, and they can fall behind, especially kids that are in a lower economic status, and the parents can’t afford or don’t know where to get the help that they need. So this big funding boost is going to help them expand their platform and get into new international markets, so hopefully we will have over here in the US before too long. I might try to reach out to the folks and see if we can learn more about the app, but I wanted to start off with a good story that an angel investor comes through, sees a need, see some people trying to start a program that’s going to be able to help folks and invest their own money into that in order to help them. It’s always good to have a nice story to start off the show. Will put a link in our show notes so you can find out more about Rockmelon and the investor. There are all kinds of technology out there for adaptive learning. When we all thing about going back to school and think about something that everyone uses, textbooks and running portals and all those things, something everyone uses. McGraw-Hill is probably one of the biggest companies to do those. I found an article by Ray Kelly over at CampusTechnology.com. The title of the article is, “McGraw-Hill upgrades adaptive learning engine.” It talks about their smart book 2.0 program, and it is to connect homework and learning management solutions and uses adaptive tools to serve a personalized learning content for the student’s individual needs. It kind of helps the student actually be able to personalize their assignments the way they are reviewed, how they look at them, break things down by topic, subtopic. They can really support a lot of different learners. Those with disabilities or those who just learned in a little bit different way. The person can get a lot better access to the syllabus. They can change the way that the alignment goes. Everything about visually how we look at things and how we learn, it can make it a little more adaptive for each person, kind of a universal design by making it not designed the same for everyone. Also, it helps reporting and analytics on the instructor performance. There are a lot of things that has. It also says that there are accessibility features to support learners with visual, auditory, cognitive, and mobility needs. It can also be accessed on mobile devices both online and off-line. It states that smart book 2.0 will become the standard for connect users by the end of 2019. Of course, it gives successor to the McGraw-Hill site for more information on that. Very cool that one of those big companies is thinking that, hey, let’s not make everything the same for everyone. Let’s make it a little bit more adaptive by allowing the student and the teacher to be able to change for different kinds of learners. I’ll go ahead and put a link to the story in our shows. We spent a lot of time talking about assistive technology on this show, and we probably should, considering it’s called Assistive Technology Update. We talked to a lot of thought leaders, folks with different technologies that are coming out and things like that. We don’t spend a lot of time talking about folks that are using that technology. So I found an interesting article on a column that I will probably start following called My Machines and Me. It’s over at SMA news today and as part of a column called, “Embracing My Inner Alien,” by Kevin Schaefer. Kevin talks about some of the things he uses from a vest airway clearance system, a coughing assist machine, robotic arm, all kinds of things he uses in order to get through his day, as well as some things we talked about here like using Alexa for spotify, the Amazon fire TV cube to be able to use a television, and all those things. It talks about feeling kind of like Darth Vader just because you have all these devices to help you out all the time. But it also gets into how Kevin does not have to be as dependent on other folks because he has this technology to help him with a lot of daily tasks. My favorite part of this article in what it gets into is getting a break from technology, being able to see the sunlight, get the fresh air. It really says that of all these things, the most powerful sensation is just the simple things like face-to-face human interaction. Even though we do talk about assistive technology and how it can help individuals with disabilities on this show, I know many of us use technology in our daily lives and to accomplish a lot of tasks and to help us with a lot of things, it’s really important to not forget those simple things, just spending time with friends and family and simple person-to-person communication, whatever that may look like for you or whatever kind of technology used to accomplish that. It’s very important to keep those things in the front of your mind and be able to remember that those things are really important. He ends the article by just saying, “Nevertheless, I’ll never pass up the opportunity to show off my robotic arm.” I definitely don’t blame him for that. I’ll put a link to Kevin’s article in the show notes so you guys can check it out. So we think about distance communication for folks who are deaf or hard of hearing. We might think of the videophone or the TTY. These have been around for a long time. But what about when those don’t work? What about when you need to use your cell phone if you don’t know sign language? That’s a question that our guest today kind of asks. Our guest today is Lorenzo di Ciaccio — and I really hope I said that right. He’s the CEO and cofounder of Pedius and he is here to tell us all about it. Welcome to the show. LORENZO di CIACCIO: Thank you. JOSH ANDERSON: Before we get into talking about Pedius how can you tell our listeners about yourself? LORENZO di CIACCIO: Of course. I have an IT background. I previously did work for Intel. I had a revolutionary moment on television, watching the story of Gabriello, a deaf guy that had a car accident, and he was unable call a tow truck. That was very surprising to me, and I decided that day to do something. The thing is that there was not any other solution involving a human interpreter. In any other situation in Italy, we don’t have any relay service act of 24 hours. This is a huge limit, and I decided to do something different. Two weeks later, I quit my job and founded the company. JOSH ANDERSON: Very cool. It’s amazing how those things can lead us to it. You already started into it, so tell us, what is Pedius? LORENZO di CIACCIO: Pedius is basically an app that transforms a chat in a phone call. We use text to speech device technology to transform written text audio and vice versa. Basically the user can download our app for free, and they have up to 20 minutes per month of three phone calls. They type a message or they speak, if they are comfortable with it, and a real phone call will start. So there is no app required on the other side. During the conversation, the Pedius user can type a message, and the voice will read it. And in real time, every sentence will pronounce on the other person converted to text, so the person can reply. This is basically what we do with our app. We customize the experience, because we realize our users need to call more companies than they do friends, because I can send a text, I can use WhatsApp to call my friends, but I can’t do that in case I need an ambulance, not yet at the moment. JOSH ANDERSON: Very true. Basically, if I am a deaf or hard of hearing individual, I just type what I want and the other person doesn’t know I’m typing, really. They’ll just hear it come right out invoice as if they are talking to someone normally on the phone. Is that correct? LORENZO di CIACCIO: If you talk, you can use your voice. Otherwise use the typing. We create a different user experience just to take time, because typing is four times slower than speaking. We say a message like, I’m typing, and we put some sounds that tell the people to way and be more patient in this conversation. JOSH ANDERSON: That’s really good, especially when you talk about emergency services and tow trucks, if they get that dead space, they might hang up on you and that defeats the purpose. LORENZO di CIACCIO: Yeah. Generally, with mission-critical services like emergency system, we do some training. We include in the package for the company some training, just to let the operator listen to Pedius voice and recognize. Also we give some tips to increase the chance of a good conversation. This problem happened a lot of times when users try to call services without informing that they are using a service such as Pedius. If you try to call a restaurant during rush hour, and they listen to an artificial voice, they start thinking about a commercial and annoying phone calls. That is very important at the beginning with the first message, explaining in just one sentence what is Pedius. JOSH ANDERSON: I’ve got to know, how did the name come about? LORENZO di CIACCIO: That is a very particular thing. Since when we started, I didn’t know any deaf person in my family and my community. But then I realized that something that is assigned for deaf people to include their culture. Opening a book of deaf culture, there was a story of the first deaf person that history reports. In ancient Roman time, there was this brutal option: you can kill your children if there is any problem up to five years old. But deaf children escaped from this brutal selection — because after five years, if you are unsure if your child has any kind of issue, you cannot kill them anymore and they would work most of the time as a slave. So they could not live a real life that would leave a trace. Quintus Pedius was from a noble family. They couldn’t allow a noble to be a slave, so they tried to teach him something. He became a painter. Quintus Pedius was the first example of education for a deaf person. I thought it was a good idea to choose that name for the app. JOSH ANDERSON: That is a great name for the app. When did Pedius start? Not back in Roman times, but as far as the app itself? LORENZO di CIACCIO: The company started five years ago, and the idea came six years ago. After having the idea can we got the prototype and incorporated the company in October of 2013. At the beginning, we decided to create a company just to have more power. Because creating a foundation would be limited on the nation of charities, and we don’t want to do that. So we were able to convince phone companies and other investors to believe in this project and to believe that solving a social issue is possible and also profitable somehow. We were able to raise in those five years almost $2 million from private investors. One of the lead investors was the national provider in Italy. That’s creating a new way to invest money, not only for an economical return but also to generate impact. We also provide every six months and impact, a balance of our impact, that evaluates what the money that we got is doing in the world, in society. JOSH ANDERSON: Very nice. That’s very good, because that makes it sustainable as opposed to just relying on donations and continue to improve. Where is it available? Is it available just in certain countries? Worldwide? LORENZO di CIACCIO: We have 12 countries. We go country to country because we add local support. Our team is able to speak seven languages. The last country we added was China. We are opening a branch in Hong Kong. We are active in Brazil, as well as the US and Canada, and then mostly Europe, except for the eastern part of Europe. JOSH ANDERSON: I imagine that’s hard with all the different languages, dialects, and emergency services getting all the stuff working and support. That’s got to be a challenge. That’s pretty impressive that you guys are already in the full 12 countries. LORENZO di CIACCIO: The main issue is the quality of the voice recognition. For instance, for a country where we have not enough speakers to produce a good quality, but is artificial intelligence works on data. If you have enough data — like in English, it’s full of English speakers in the world, so we have a very good model for voice recognition. But Romanian is very hard to find a good description. In that case, we don’t have enough quality to ensure for the user a good feeling during conversation. We don’t want to annoy our user about any technical excuse. We just want to provide a service that works. JOSH ANDERSON: I can definitely see that. If the recognition isn’t good, I’m sure it could cause for some major problems, especially the tow truck example. If you’re trying to get them to the right place, any change in recognition can cause a major problem. LORENZO di CIACCIO: As a business, we work a lot on price. Pricing is the best way we can show our social mission. The price for one year unlimited phone calls is $30. $30 a year, and you can make all the phone calls you want. This pricing is more like a philosophical pricing, because we want to change the paradigm that disabled people need to be assisted, and someone has to pay the service for them. We want to make a service affordable enough to treat them not as disabled but just as a customer. Don’t ask in any part of our app how you are deaf or how much is your hearing. You just download the app, and if you want to use our service, you just became a customer. This is our way to do it. JOSH ANDERSON: That’s a very reasonable price, especially for unlimited. Is it available on all platforms, iOS, Android? LORENZO di CIACCIO: IOS and android and also over web, so you can use it from your computer. JOSH ANDERSON: Very good. So if you didn’t have a cell phone, as long as you have a computer and the Internet, you can use it. Very nice. LORENZO di CIACCIO: Especially if you need to type, it’s much more comfortable typing on a computer keyboard instead of on your phone. This is very useful when Pedius is used for work purposes. JOSH ANDERSON: Is there a business person as well? Let’s say my company, if I have some hearing-impaired individuals working for me and I wanted to be able to offer them this service, is there a business version of it? LORENZO di CIACCIO: Definitely, yes. We recognize that working with companies, not being able to make phone calls can be a limit for a deaf person. We realize that a business version could be very useful. What we are doing is adding the support for all the conference phone calls. This is the biggest limit. Like what we are doing right now, speakerphone is not possible for deaf people [INAUDIBLE]. In our app, we added the support to the company’s conference system. So we added support for Skype for business and also some other bridging services. Also, we have a special number that the user can give for work reasons, so they can receive phone calls and also make phone calls and joint conference calls. Another feature we have for business usage, especially if some company has their own language [INAUDIBLE] and general-purpose engine is not able to recognize. What we do is to track the specific word and add it, so we know that if you’re using Pedius in your company, you are pronouncing the name of your company, so we are able to know the way the name is pronounced properly. Just a small thing we give to our professional users. JOSH ANDERSON: That’s really nice that you can train it so that it can understand those things. I could understand how that could be a major problem if it didn’t understand those. LORENZO di CIACCIO: The company is more aware about those little things that, for your personal usage, you would not mind if they misspelled your name. But in the work environment, this small difference matters. JOSH ANDERSON: For sure. Can you tell me a story or a couple about someone who has been helped by this? LORENZO di CIACCIO: We release stories on our website, because we may interview our users who are very happy and want to share their stories. We take this as an example of accessibility for the company. We had one story of a lady working for HP. The first thing she made was a phone call to her boss, and when she said, “Hello, boss, can you hear me?” And it was like, I thought you were deaf. What happened? Why are you calling on the phone? That was the first thing she did. Then she started talking with her colleagues. It became kind of a joke, kind of like a stalker, because she would make all the phone calls that were possible to do all in one day. Take away this app! She’s calling too much. It was just for fun. Another story I have — and my memory is probably worse. The first memory I had at the very beginning when Pedius was just developed by me and one of my friends [INAUDIBLE], it was the first working version we had. We received an email from a lady named Monica. She was pregnant and was feeling sick at home. She didn’t have any chance to call the doctor, but she was one of our beta testers. She tried to call the doctor using our app, and she managed it. The doctor came to her place, visited her, nothing serious, fortunately for her. She wrote as an email, “This is the best day of my life because I feel independent.” We call this our first salary. This is probably one of the stories I could share of our app. JOSH ANDERSON: Very cool. I’m sure there are even more stories out there of folks it has helped. If our listeners do want to find out more, read those stories, what is the website to make sure we get that offer everybody? JOSH ANDERSON: We will put that in the show notes. You don’t sound like the kind of person that is just going to sit around and let things go and stay the same. What does the future hold? LORENZO di CIACCIO: We are already working on a different project. We realize that one of the biggest problems for the deaf community is education. I’ll give you an example. In Italy, only three percent of the deaf population is able to get a degree. The old system is not accessible at all. Today in the conference, I met the first deaf lady who was able to get a PhD in China, and it was almost 10 years ago. Considering out of 1 billion people, 10 years ago only one deaf person was able to get a PhD without hearing, it’s very scary for me. We put a lot of effort towards making education more accessible. We are also thinking through other kinds of, let’s say minor problem that is hearing loss. Deaf people are widespread by age, but hearing loss is more common by aging. Hearing loss starts in higher frequencies, so seniors who start losing their hearing, Lose the capacity to hear high-frequency sounds. The phone doesn’t have very low frequencies, so only medium and high frequencies. That means it’s a problem. While, for a deaf person, making a phone call could be a need, for a senior it is more a pleasure of chatting. Seniors [INAUDIBLE] able to understand half of the word. That means they can do a phone call if they need, but it is the pleasure of chatting with their friends. This brings other social issues, and we want to come to a solution, providing more easy to use, integrated, like a smart TV and other devices, any chance to bring captioned phone calls as a standard in the telecommunication industry. It is our dream as a company. JOSH ANDERSON: I think that’s a great dream and I would love to see that come to fruition. Thank you so much for being on the show today and telling us all about Pedius. It’s a great program and I think it can help a lot of people. Thank you again for being on the show. LORENZO di CIACCIO: Thank you for amplifying my message to your audience. I’m happy to be part of that.